Roanne is a commune in the Loire department in central France. It is located 90 km (56 mi) northwest of Lyon on the Loire River. Roanne is known for gastronomy (largely because of the famous Troisgros family), textiles, agriculture and manufacturing tanks. Premiere Classe Roanne - Perreux is situated in Perreux, France, seven kilometres from the town of Roanne. The nearest airport is Saint-Etienne- Bouthéon Airport, 72 kilometres from the hotel. Parking is available on site. There are facilities for tennis and horse riding within five kilometres of the hotel, and a golf course 20 kilometres away. 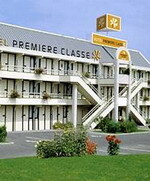 There are 72 guestrooms at Premiere Classe Roanne. All rooms include wheelchair accessibility. Rouen is the historical capital city of Normandy, in northern France on the River Seine, and currently the capital of the Haute-Normandie (Upper Normandy) region. Once one of the largest and most prosperous cities of medieval Europe, Rouen was the seat of the Exchequer of Normandy in the Middle Ages. It was one of the capitals of the Anglo-Norman dynasties, which ruled both England and large parts of modern France from the eleventh century to the 15th century. It was in Rouen where Joan of Arc was burnt in 1431. People from Rouen are called Rouennais. 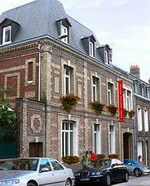 The Best Western Hotel du Vieux Marche is set in a six-floor building and located in the center of Rouen, across the street from Place de Vieux Marché. In the La Toque D'or restaurant, Normandy style cooking is served in a room with a relaxed ambience. Guests can unwind in the hotel's bar where a range of alcoholic and non-alcoholic drinks is served. For guests' convenience, the hotel has a 24 hour front desk with a safe deposit desk. The Best Western Hotel du Vieux Marche also offers dry cleaning services and safe garage parking is available for those arriving by car. Rouen's major attractions are all close by with Le Gros Horloge, the Church of Saint Jeanne d'Arc, the Palace of Justice, the Cathedral and the River Seine all within 2 kilometers. The Ermitage Bouquet is located in Rouen, France, 400 metres from Rouen Rive-Droite Station, 700 metres from Old Market Square, and 800 metres from Rouen Cathedral. This hotel is housed in a refurbished 19th-century mansion and offers complimentary high-speed Internet access throughout. Parking is available for a surcharge. 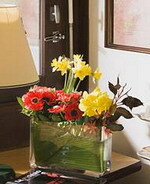 Ermitage Bouquet offers breakfast services (surcharge) and room service during limited hours which consists of French dishes. The 13 air-conditioned guestrooms come equipped with satellite television, complimentary high-speed Internet access, minibars, complimentary toiletries, and hair dryers. Royan is a commune in the Charente-Maritime département, in south- western France. Inhabitants are called royannais and royannaises in French. An important seaside resort with an international reputation, Royan is a city of 18,100 inhabitants in the heart of an urban area estimated at 38,638 inhabitants, which makes it the fourth largest conurbation in the département after La Rochelle, Rochefort and Saintes. Capital of the « Côte de beauté », the city is located in the mouth of the Gironde Estuary, the largest estuary in Europe. Royan has five sandy beaches, a marina and a fishing port. Famous from the nineteenth century for its « Bains de mer » (sea swimming), this very rich resort welcomed numerous artists during the roaring twenties. Ravaged by terrible bombardments in 1945, the city was declared a research laboratory on town planning and since then has an architectural heritage dating from the 1950s (modernistic architecture). The city's post-war revival allows it today to welcome up to 90,000 inhabitants at the height of the season. 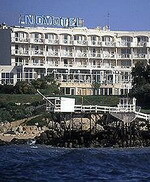 The Novotel Royan is located in Royan, France, one kilometre from Promenades en Mer and 15 kilometres from Talmont village. The Cognac Pineau distillery is 20 kilometres away. Fitness facilities include two swimming pools (indoor and outdoor), a hot tub, a beauty salon, and s steam room. There are six meeting rooms available with a maximum capacity of 50 people. The restaurant at the Novotel Royan offers terrace seating. Drinks are available from the onsite bar. There are 83 guestrooms that include wireless Internet, satellite television, air conditioning, hair dryers, and minibars. Saint-Malo is a walled port city in Brittany in north-western France on the English Channel. It is a sub-prefecture of the Ille-et-Vilaine department. Built in 1820, the remodeled Best Western Central in Saint Malo, France, is located in the center of the historic town, with its ancient streets, panoramic bay and impressive architecture. 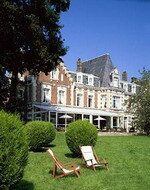 This charming hotel sits 300 meters from the seafront and casino, and is less than a four-hour drive from Paris. Due to the hotel's convenient location, much of the town can be visited on foot. Guests can also rent bicycles at the hotel or catch a bus from the main station at Esplanade Saint Vincent. Frequent buses run to Mont Saint Michel, 50 kilometers away. 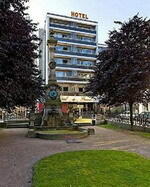 Dinard International Airport is 15 kilometers from the property. Best Western Central guests can enjoy drinks at the wood-paneled bar before feasting on fresh seafood specialties, all caught locally, at the on-site La Pecherie Restaurant. Saint-Omer is a commune and sub-prefecture of the Pas-de-Calais department 68 km (42 mi) west-northwest of Lille on the railway to Calais. The town is named after Saint Audomar, who brought Christianity to the area. The canalised portion of the river Aa begins at Saint-Omer, reaching the North Sea at Gravelines. Below its walls, the Aa connects with the Neufossé canal, which ends at the Lys. Built on the remains of a 17th century manor, the Chateau Tilques is a neo-Flemish chateau set in parkland and situated five kilometres from the historic town of Saint Omer. Lille Airport is 80 kilometres away and takes approximately 60 minutes to reach by car. The Chateau Tilques is set in ten acres of lush parkland dotted with sun loungers and umbrellas and leading down to tennis courts and a boules pitch. The hotel houses an elegant bar hung with chandeliers and served by a roaring fire and amenities include a seminar room and complimentary on site parking. Overlooking the park, Le Vert Mensil restaurant is set in converted stables with exposed brick walls and a log fire. The restaurant serves traditional French cooking with dishes such as Seabass Pannaquet with Aubergine and Red Wine and Grilled Contrefilet of Beef, along with wine drawn from an extensive cellar. Saintes is a commune in south-western France, in the Charente-Maritime department of which it is a sub-prefecture. Situated 1.5 kilometres from Saintes, Campanile Saintes is 122 kilometres from central Bordeaux and 126 kilometres from Bordeaux-Merignac Airport (BOD). Guests can dine in the hotel restaurant, have a drink in the bar, and use Internet points to plan days out. Complimentary onsite parking is available. There is a beach 25 kilometres away from the hotel. There are 48 guestrooms at Campanile Saintes. All rooms have Internet ports, air conditioning, and wheelchair access. Sète is a commune in the Hérault department in Languedoc-Roussillon in southern France. Known as the Venice of Languedoc, it is a port and a sea-side resort on the Mediterranean Sea. 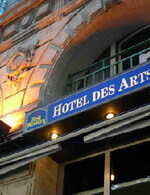 The Best Western Hotel des Arts is located in Sete, France. The hotel is 100 metres from the train station and 800 metres from Sete's city centre. The fishing harbour is one kilometre away and Corniche beach is three kilometres away. 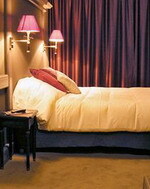 Air-conditioned throughout, this port hotel combines nineteenth-century architecture and modern-style furnishings. Multilingual assistance and a safe-deposit box are available at the front desk. 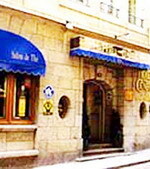 Best Western Hotel des Arts houses a Jazz-style bar which offers a range of locally produced wines. The hotel has three conference and meeting rooms, and complimentary wireless Internet access is available. Nearby water sports range from sailing to water skiing and scuba diving. Strasbourg is the capital and principal city of the Alsace region in north-eastern France. Located close to the border with Germany, it is the capital of the Bas-Rhin department. In 2006, the city proper had 272,975 inhabitants and its urban community 467,375 inhabitants. With 638,670 inhabitants in 2006, Strasbourg's metropolitan area ("aire urbaine") (only the part of the metropolitan area on French territory) is the ninth largest in France. The transnational Eurodistrict Strasbourg-Ortenau has a population of 884,988 inhabitants. Strasbourg is the seat of several European institutions such as the Council of Europe (with its European Court of Human Rights, its European Directorate for the Quality of Medicines and its European Audiovisual Observatory) and the Eurocorps as well as the European Parliament and the European Ombudsman of the European Union. Strasbourg is an important centre of manufacturing and engineering, as well as of road, rail, and river communications. The port of Strasbourg is the second largest on the Rhine after Duisburg, Germany. The city is the seat of the Central Commission for Navigation on the Rhine. Strasbourg's historic city centre, the Grande Île ("Grand Island"), was classified a World Heritage site by UNESCO in 1988, the first time such an honor was placed on an entire city centre. Strasbourg is fused into the Franco-German culture, and although violently disputed throughout history has been a bridge of unity between France and Germany for centuries, especially through the University of Strasbourg, currently the largest in France, and the co-existence of Catholic and Protestant culture. The Best Western Hotel de France is a modern, five-story building situated 500 meters from Strasbourg's old city, and three kilometers from the European Parliament. Guests can plan their day's itinerary via high-speed Internet access (fee) in the public areas, or relax in the lounge with a complimentary newspaper. Business guests can make use of the newly renovated seminar room, which hosts up to 40 people and is equipped with standard business and presentation facilities. Nearby attractions including restaurants, the old city and the Museum of Modern Art, are all within 500 meters of the hotel. The cathedral lies one kilometer from the hotel and the European Parliament is three kilometers north of the city. 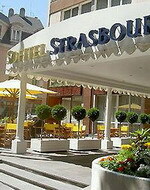 Strasbourg Airport is 12 kilometers from the hotel, with an approximate driving time of 15 minutes. The airport has a shuttle service which runs to the Baggersee tram stop, on the A line. Guests should take the A tram line in the direction of Strasbourg, and alight at the Homme de Fer tram stop, which is in the hotel vicinity. 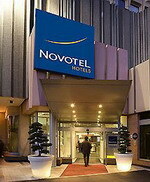 The Novotel Strasbourg Central Halles is a modern hotel built in 1978 and is located in the centre of Strasbourg, 500 metres from the city's medieval area Petite France. The hotel's facilities include wireless internet access (surcharge), fitness equipment, and a business centre, and there are four meeting rooms with a maximum capacity of 40; complimentary newspapers are available in the lobby. Onsite shopping is available in Les Halles shopping mall under the hotel. The Cote Jardin Restaurant serves traditional French dishes for lunch and dinner while the Novotel Café offers pastas, salads, and desserts in a contemporary setting. Cinema Vox is 500 metres from the hotel and the modern art museum is one kilometre away. The Sofitel Strasbourg Grande Ile is a six-storey modern hotel located in the city centre, within one kilometre of the cathedral and two kilometres from the European Parliament building. The Restaurant du Sofitel serves innovative French cooking and regional specialities, accompanied by a selection of fine wines, and opens onto a terrace for outdoor dining. Open until late, the Bar le Thomann serves a wide range of cocktails and other beverages, alongside snacks. Motorists can make use of secure parking facilities, and valet-parking services are available on request (surcharges apply). Visitors an wander among the half-timbered houses of the historic, picturesque district of Petite France, one kilometre from the hotel. The Strasbourg Evénement concert hall is two kilometres away, as is the Museum of Modern Art.